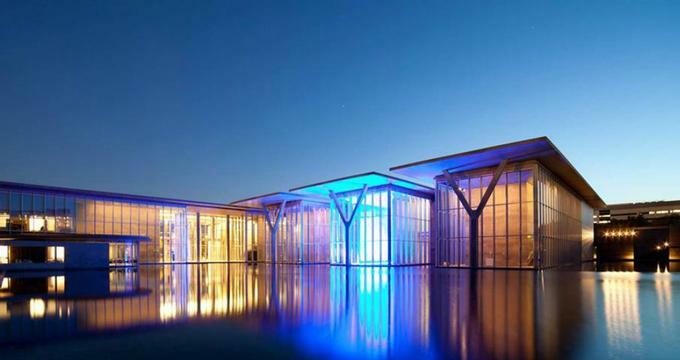 The Modern Art Museum of Fort Worth, Texas is affectionately referred to as The Modern and is the oldest art museum in the state and one of the oldest in the West United States. The museum was first chartered in 1892 by 25 women and has undergone many changes and name sakes including The Carnegie Public Library Art Gallery in 1901 and The Fort Worth Museum of Art from 1910 through 1954. It was not until 1987 that The Modern began using its current name. The Modern began modestly with just one painting bought in 1904. Five years later, the collection grew to 45 painting all by American Contemporary artists. These works were included in the first exhibition that the museum presented. 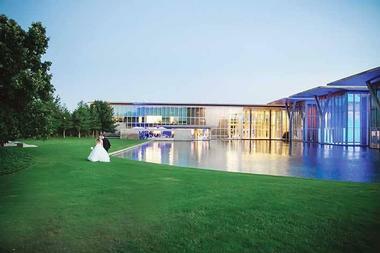 The building that The Modern is in presently was built in 2001. The space was designed by Tadao Ando and is 53,000 square feet of galleries, and an additional almost 6,000 feet that is dedicated to classroom and auditorium space. 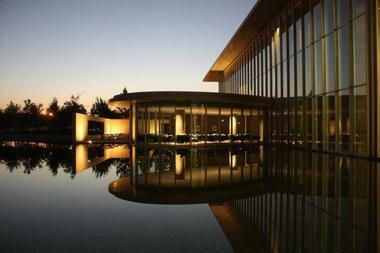 The Modern was named one of the most beautiful art museums by leading travel magazine and sits on a 1.5-acre pond across from the Kimbell Art Museum. The building is made up of five flat roof pavilions that create an illusion that the museum is floating on top of the water. 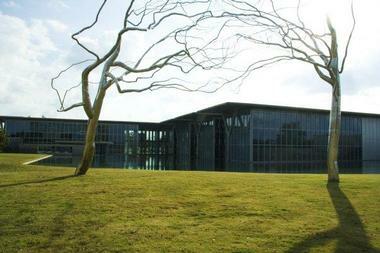 The Modern Art Museum of Fort Worth is home to a collection of nearly 3,000 post World War II art works from all over the world. The collection seems to be ever changing as pieces of the permanent collection are rotated on and off of display. Currently on prominent display in The Modern is a series called “Homage to the Square” by Josef Albers. This is a series of squares oil painted onto fiber board. There are many other pieces that represent a variety of mediums that can be found from photography to bronze sculpture, oil and acrylic paintings, watercolors and wood works. There is even some pop art reminiscent of Andy Warhol’s famous works. Currently the highlights of the permanent collection are being displayed along with several exhibitions that are on loan to the museum. KAWS Where the End Starts- The Modern is currently hosting Brooklyn born artists KAWS and an exhibition that was developed between KAWS and The Modern’s curator, Andrea Karnes. Comprised of highlights of the artist’s career, many different mediums are on display from sculpture to paintings, toys to graffiti and pop art. Many of his pieces are inspired by pop culture and cartoons such as the Smurfs, SpongeBob Square Pants, The Simpsons, and other iconic characters. KAWS is inspired by the human condition and how the most popular characters of this generation inspire human activity. 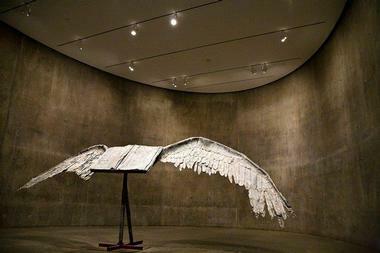 His sculptures are larger than life and emote sadness, happiness, despair and other basic human feelings. Focus: Lorna Simpson- This exhibition is being hosted by The Modern over winter and is comprised of photographs and video taken by Lorna Simpson that challenge ideas of sexuality and ethnic identity. For the first time ever, Simpson’s large-scale paintings will also be on display. Her current wide praised painting Then & Now, uses photographic collage inspiration to create a painting that evokes racial tension and seeks to bring light to race riots through time. The artist is also greatly inspired by beautiful black women through history such as those featured in Ebony and Jet Magazines. Focus: Stanley Whitney- This Spring exhibit seeks to feature the color and shape concept art by Stanley Whitney. The artist is an abstract painter known for his use of grid and squares. Whitney is inspired by minimalism and cubism. There are links to Jazz music, other painters, literature and many other forms that are cued to the viewed through the title of the work. Donald Sultan: The Disaster Paintings- This collection will also be on display in the spring and features Sultan’s landscape series. These painting are inspired by industrialization, train cars and factories, all fragile in the face of disaster. The artist uses mixed medium in these paintings making use of tar and tile as well as paint. Sultan seeks to inform the audience of the fragility of modern industrialization and modern culture. These paintings are large scale and combine certain aesthetics of nature as well. Many of the disasters depicted come from nature such as forest fires, while other disasters are human induced like arson. This collection took a decade for Sultan to complete and The Modern is the first art museum to focus on this collection as the artist is mostly known for his still life of flowers, plants, fruit and other mundane objects. Focus: Katherine Bernhardt- The late spring early summer exhibition of artist Katherine Bernhardt blur the lines between abstract and figuration. Her most recent works focuses on everyday items that are often not given a second thought throughout the average day. Her works are flat and almost cartoonish in the way they are presented on canvas as she uses a mix of acrylic and spray paint. Her motifs create patterns in her paintings. Bernhardt is inspired by textile from Africa, Morocco, and the Caribbean and these are clear in her use of color and subject. The Modern hosts several programs throughout the week for the community as well as members only. When new artists have an exhibition at The Modern, there are members only previews and artist’s receptions that take place before the grand opening. Modern Interpretations is a special program for the Deaf community to tour The Modern with interpreters. This event takes place once a month and includes a gallery activity. Tuesday Evenings at The Modern is a weekly lectures series by many different members of the artistic community from painters to architects and historians. Many times, the lectures series will be led by the artist of the current special exhibit. The program takes place in the auditorium with overflow seating available in The Café where the lecture is live fed. The Café will also serve cocktails and hors d’oeuvres. 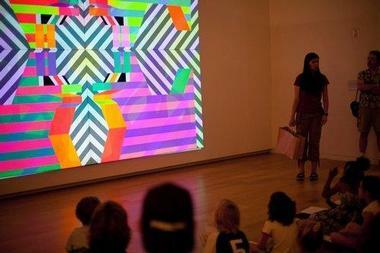 First Fridays at The Modern is a docent led tour through the galleries that is available the first Friday evening of every month. Graduate Gallery Talks is a program offered only in the fall for graduate students with an art related major. The tour focuses on the history of the art works and are tailored for those with a degree in art; however, the public and members are welcome to attend the advanced program as well. Slow Art at The Modern is held every third Friday of the month and is for people who want to take their time in enjoying art. The 30-minute tour is led by a docent and focuses on only one work. Wrap it up in The Modern Shop is an annual event near Christmas time for shopping, food and jazz music. This formal event is for members only and features many works for sale that are exclusively reserved for member purchase. Spanish-language Tour- The first Sunday of every month at 2pm there are docents at the museum that are available to lead complimentary tours in Spanish. There are also French, German, Mandarin, ASL interpreters that are available if reserved two weeks in advance. Drawing from The Collection is a program for children where they learn basic drawing skills from an artistic professional. Each of the drawings will relate to or correspond with a piece of the permanent collection. Wonderful Wednesdays is a family fun day. Parents with young children are encouraged to come to The Modern and participate in a tour with a docent that is tailored for little ones. There are also gallery activities to enjoy. Magnolia at The Modern is a film series put on at The Modern to show critically acclaimed films. Some of the films that are being shown are Sundance Film Festival grand jury nominee Author: The TJ LeRoy Story, A Man Called Ove, The Handmaiden, Certain Women, and The Dress Maker. The films are shown on multiple weekends a month usually and have screenings on Friday, Saturday, and Sunday. Café Modern is the dining option at The Modern that isn’t what you would normally think of as a café. All the food is prepared from locally sourced fresh ingredients and made from scratch. The Café serves a weekend brunch, lunch and dinner on weekdays and dinner on Tuesdays during lecture and Friday nights. There is also a full service bar during open hours Tuesday through Saturday with extended hours on Friday nights. Some of the dinner menu options include duck breast, pheasant, Sea Bass, Red fish, and Curry. There are also many first class appetizer options on the dinner menu. Lunch is a little more subdued with salad options, curry, pasta, and chicken, as well as several sandwich options. The brunch menu has many classic savory breakfast options such as omelets, eggs benedict, and duck with some sweet options like waffles. Sandwich and salads are also served. The auditorium is used several times a month to host concerts, orchestras, play and dance. Tickets are for sale in advance of these events and are not included with admission to The Modern.